Let us go through the pAsuram and its meanings first. pazhudhu – is of no use. mudhal AvAr mUvarE – instead of holding on to everyone saying “he is emperumAn” “he is emperumAn”, it is good to say that there are three important deities so that it will be easier to discard two. am mUvaruLLum mudhal AvAn mUri nIr vaNNan – there is no one apart from these three who is an important deity. Nor is there anyone else who, along with these three, could be termed as a primary deity. Among these three, the causative entity [who is the cause for all the worlds] is the one who has the complexion and form of ocean which keeps throwing out waves. 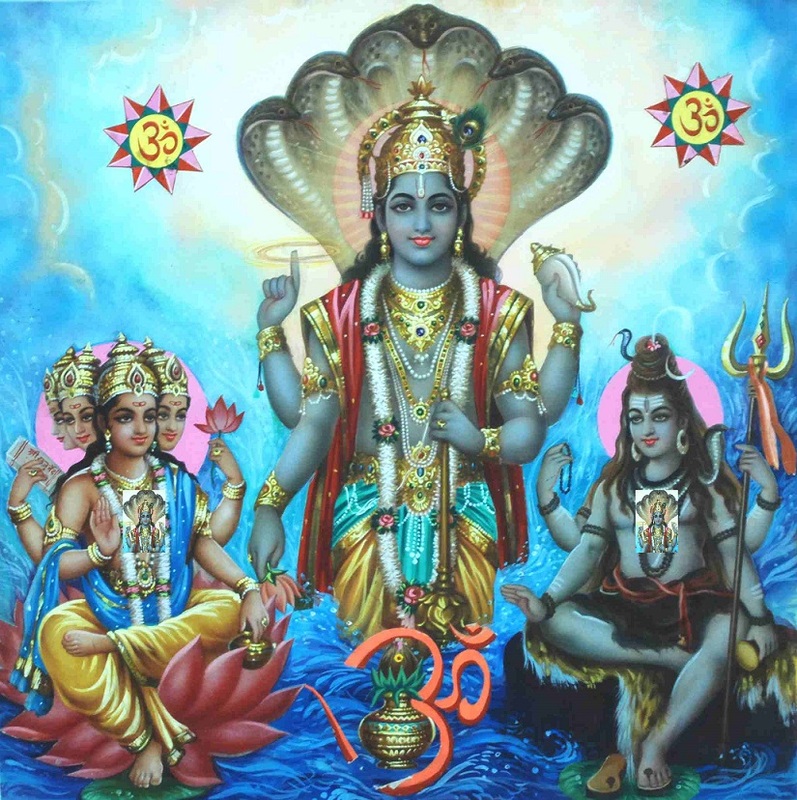 It is he who dwells within the souls of brahmA and Siva as antharyAmi (in-dwelling soul) and manifests himself as the unique vishNu, and protects the worlds. In thirunedunthANdakam 2, thirumangai AzhwAr says “Or uruvam pon uruvam onRu sendhee” (one of them is of golden hue [brahmA] and one is red in colour [rudhra]). AzhwAr rejects these two and says that the thirumEni (divine form) of emperumAn is like the ocean. pallAr aruLum pazhudhu – the grace of all others [deities] is of no use. The grace of brahmA and Siva as well the grace of many other deities, without any difference, are of no use. Alternatively, we can consider nAmam nIr vaiyagaththup pallAr aruLum pazhudhu as one sequence and say that the grace of all those deities who believe that they have some name on this earth is of no use. pazhudhu not only denotes that it will not bear fruit but will also be responsible for losing emperumAn’s grace. Giving up the other deities is equivalent to obtaining emperumAn’s grace for the jIvAthmA (sentient soul). thirumazhisai AzhwAr in his nAnmugan thiruvndhAdhi 68 says “thiruvadi than nAmam maRandhum puRam thozhA mAndhar” (even if people forget the divine names of emperumAn, it could be acceptable; but they should not worship other deities). rishi mArkaNdEya who was for a very long time a devotee of Siva, felt ecstatic when Siva gave him up. The rishi felt as happy as vibhIshaNa felt when rAvaNa gave him up. emperumAn is the antharAthmA (in dwelling soul) of all deities and all means. If he does not wish to shower his grace on someone, he will create interest for such a person in other matters and remove that person from him. He will remove the desires of his followers in other matters and enable them to enjoy him. Let us move on to the 16th pAsuram. This entry was posted in mudhal thiruvandhAdhi on June 24, 2017 by T N Krishnan.